Great news!!! During the past summer the Mayor of Amorgos graciously accepted our invitation to offer a piece of land as the first shelter for some animals of the island. AZI has sponsored the construction of a new stable on the land. Designed and constructed by Antonio Marvos, the stable is set on the slope of a lush, green field and has the capacity to house several large animals. Paola the horse and Pepperina the donkey are the two first residents. It is thanks to Evangelio, Katerina, Rita, Theodosi, Anna and Dr. Despoti that Paola has recovered so well and Pepperina, at almost 30 years old, has found a new home to spend her last years in old age. Despite the occasionally kicking around, they are always close together both calling each other when they are separated for a while. This is significant step in the life of the island as it is not common to have fencing and shelter for equines. The preferred method of restraining is to hobble the animals by tying their legs together, to keep them confined. Thus, most importantly this construction marks the beginning to the end of the cycle of neglect and abuse. Everyone is welcome to visit and learn how to care for the animals. Educational programs at the stable will teach children empathy, compassion and how to care for pets and farm animals. Tourists will find a tranquilrepose here which will promote a more welcoming atmosphere to the island. Oct 2010—Working with the mayor and government council, Animal Zone has moved forward on our plan to hire a vet for the island of Amorgos. Dr. Maria Despoti, a young veterinarian from Thessaloniki, arrived in Amorgos in mid-October 2010 for a two-month trial. For us, this means gaining ground in our goal of maintaining a healthy cat population, and providing regular healthcare for the neglected dogs, goats, mules and all other animals on the island. So far, she has worked closely with the local animal group PMAA for all regular and emergency animal care, such as caring for Paola the mare, treating a cat with crushed feet, vaccinating the dogs up the mountain as well as the two puppies that have been recently saved. We are pleased to hear that as the Amorgosian community learn of Dr. Despoti’s presence, they are bringing the stray animals from their distant villages, in particular the village of Lengarda, to the AZI clinic for sterilization, vaccinations and basic healthcare. We hope to extend her contract for a year. As you can imagine, expenses for retaining a vet, the medicine and vaccines needed for the animals, and other costs of operating an animal clinic require a lot of money. This is our main goal for raising money now. We believe having a vet available on the island will completely transform the lives of the animals as well as the community. Sept 2010 — For the past year, Animal Zone has worked tirelessly to set up a veterinary clinic in the village of Xilokeratidi, supplying it with much needed medical equipment. In order to keep the clinic open and available to the community, we need your help—please make a donation. Prior to this, the only vet facility that was available was provided by the municipality, and was not more than a space (no equipment), in the village of Chora, which is a great distance away. Our new facility, open since January 2010, is located in a rented basement of a local pensione, and serves all animals of the areas of Xilokeratidi, Katapola, Rachidi and Nera and all other animals that are brought to it. Without the completion of this facility, it would not be possible to have a vet come and take care of all the regular and emergency medical care for the animals of the island. Sept 2010 — Responding to a call for help from members of the new animal association (PMAA), this summer AZI became aware of the tragic existence of a mare, donkey and mule, owned by a shepherd but not cared for by him. They lived without shelter, not enough food, insufficient water, and with their legs tied tightly together (see photo). It upset a tourist from Athens so much that he notified the police and pressed charges, but without any consequence. That justice is being sought is significant; however, these animals require immediate attention, especially the mare. We have learned that the donkey and mule were bought by a local shepherd and unfortunately, we are unable to locate them at this time. As for the mare, with the help of the Mayor, the owner was persuaded to sell the mare to the newly formed animal association. AZI has pledged the money for her purchase and upkeep, and she will be kept on land offered by the Mayor. AZI is financing the construction of a fence and shelter for her. We hope to save and purchase other horses, mules and donkeys (which, incidentally, are now an endangered species on the island, due to mistreatment). Most of these animals are abandoned, castaway as unfit for work, in the middle of nowhere, with no food, no water, and with their legs tied together to restrict their movement. Dec 2010 — A fence has been constructed for Paola and she is being cared for by our vet, Dr. Despoti. However, there are still a couple of missing items before she can be safe and sound in her new home. First, as the winter is soon approaching, we are urgently planning and preparing to build a shelter/stable for her in the fenced-in area. The stable will hold up to 4 animals and will have storage space for hay. Second, in order to get hay for Paola, it must be ordered and shipped from Athens, a costly expense. We are working furiously to raise funds to cover these very important needs. Sept 2010 — We are thrilled to announce the formation of the Philozoic Merimna Association of Amorgos (PMAA), an association of volunteers who are dedicated to the protection and care for all the animals on Amorgos, from the strays to the domestic and productive animals. This is a dream come true. This group will be our interlocutor on the island and will not only help to identify and prioritize issues but also ensure that the solutions adopted are fully implemented. AZI is currently offering PMAA financial support as they begin to get organized. 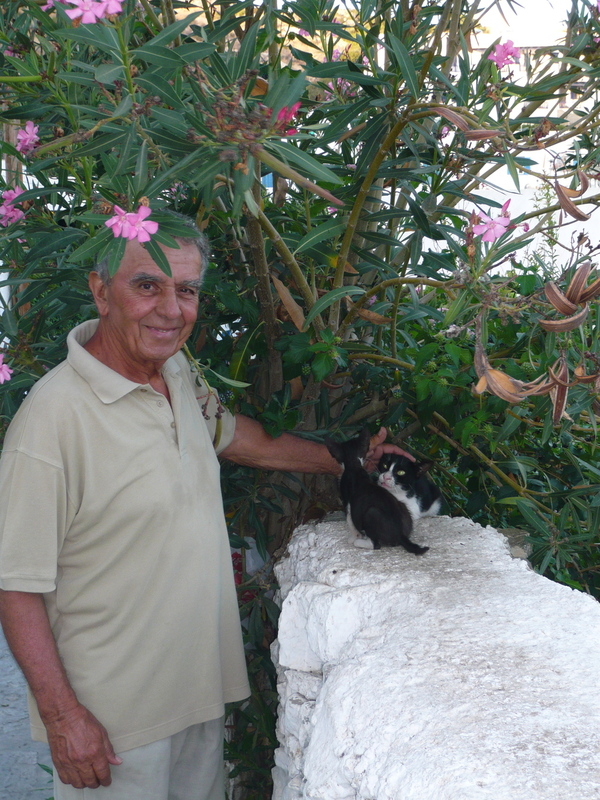 Fall 2010 - One of the founding fathers of Philozoic Merimna Association of Amorgos (PMAA), Manolis has been feeding approximately 50 cats every day for a number of years. Some across the street from his house, some at Nonda's orchards about 2 miles away and some behind the Saint Georgios Balsamitis Hotel in Xilokeratidi. When Manolis goes home from work many cats show up from no where to greet him. 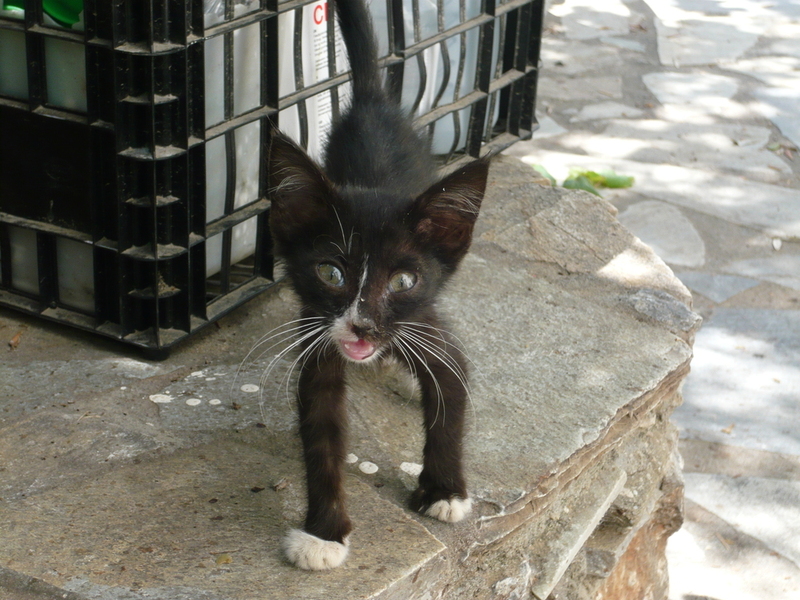 August-December 2010 - A sea captain who leaves in Naxos keeps dozens of sick and malnourished cats in the garden of his house in Nera, Amorgos. They are affected by the worst kind of infections. 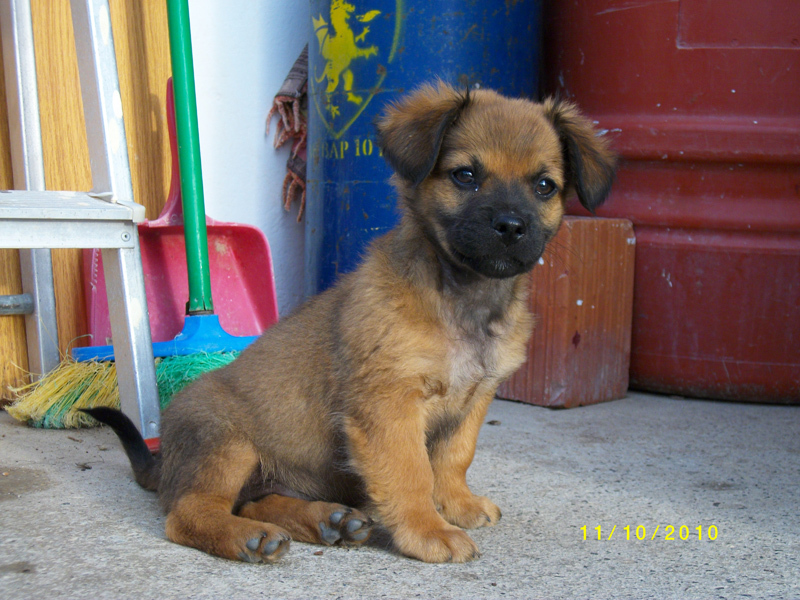 On August 21, 2010 we visited the premises with Dr. Vassalakis and started treating them for parasites. In November Dr. Despoti continued the program vaccinating and sterilizing them. Unfortunately one very sick kitten could not be saved. Sept 2010 — In August 2010, an important document from the Office of Public Safety was circulated to the local agencies requiring the local police departments to take seriously the complaints of animal abuses or death they receive from individuals and groups. It appears that the Greek government is becoming aware of the negative press the country is receiving in response to the treatment of animals that is being witnessed by Greeks and tourists alike and commands that the local agencies take immediate action by investigating and enforcing the law. It is significant that the official line is now to cooperate with animal rights groups such as our. It certainly helps when we have the Mayor on our side and joining our efforts. Oct 2010—One day in May, near the area we call “The Rubbish Dump,” a young, frightened dog appeared, chained to the wall where a local goatherd keeps some of his dogs. We named this new dog Baloo, after the lovable gray bear in “The Jungle Book” by Rudyard Kipling. He was left there without shelter and insufficient food and water, and so he became one of the dogs in our care. Although there have been many reports and complaints filed against the owner by visitors who were appalled by Baloo’s living conditions, so far no action has been taken. In the summer, Baloo was moved to another wall at a deep pit below the road, where he was meant to bark at the goats or sheep whenever they would come close to the road. Fortunately for Baloo, he is visited by Lamia, co-founder the new local animal society, who gives him food and water and takes him on a walk every other day. He has also been given vaccines and anti-parasitic medicine. Happily, he has visibly improved under her attention and care. Our work is not done until dogs are free from this kind of abusive neglect. Oct 2010 — In July 2010, the dog we now call Vressí (which means “hey you”) fell into the hands of a goatherd who is known for neglecting his animals. Vressi was originally owned by another local shepherd who used him to drive cattle, but this shepherd died unexpectedly in the summer and the dog was inherited by the goatherd. Thus Vressi had to adjust to living on a chain all day, all alone, hardly noticed by the passing traffic. During the high season, tourists would stop at the sight of the poor dog and share with him something to eat or drink. Vressi welcomes the daily visits from a volunteer. He has been wormed and vaccinated and is currently under the watchful eye of the local animal society. August-September 2010 - During the month of August Bios' mother brought him to the garden of Animal Society co-founder Manolis and left him there. Bios needed immediate attention: swollen belly, infected eyes, parasites, etc. His mother comes back daily to check on him and play with him. One eye was saved and his general welfare is improved immensely. September 2010 - This is the story of Johnny Depp. In 2009 when he was a few days old, Johnny Depp was found in a garbage bin by Vangelizza, one of the founder of Philozoic Merimna Association of Amorgos (PMAA) and a driving force behind the movement and its organization. Named after Vangelizza greatest love, he responded with great enthusiasm to the requirements of his role. He is now a happy member of the Azi family. Pocopico wasfound outside Chora's town hall. He was brought to Sophocles Prekas, one of the founding members of the local animal association, whose reputation for caring is known throughtout the island. Now cleaned, vaccinated and properly nourished, Pocopico is now beginning to enjoy his life and the company of his friends. August 2010 - Animals in general are all too often the victim of their master's cruelty and carelessness. Shepherds in particular are notoriously mean to them. Yet there are exceptions. Here an affectionate master in love with his dog contacted Dr. Vassalakis to treat a tumor growing on the animal's paw. 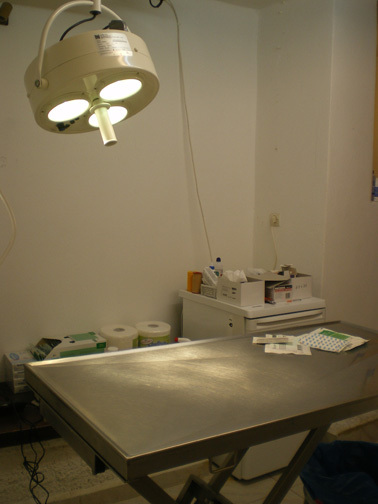 Dr. Vassalakis, our traveling vet from Naxos, went to the island of Amorgos three times during the year 2010, to continue his work of sterilization, vaccination and emergency surgeries for the dogs, cats and other animals of Amorgos. He also provided passports to those lucky dogs who were to be adopted in Holland. 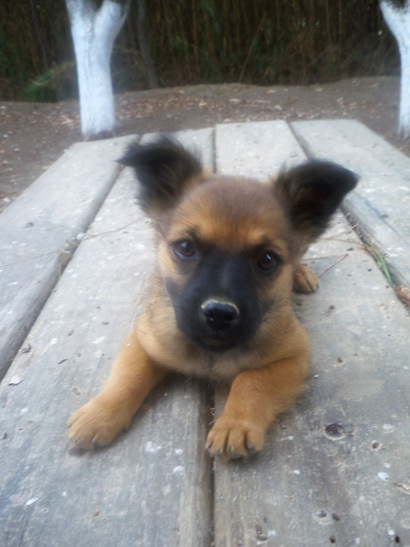 To prepare a dog for travel outside of Greece, we must micro-chip, vaccinate, and apply for a passport for the animal. All of this adds up to about 350 euros per animal. Holland is a Happy Home for Two Amorgos Dogs! Charley in his bike cart. Koutcho is now called Charley. He is living the good life with a young couple who generously adopted him after he arrived in Holland in Dec 2009. They could see beyond his lame front leg and saw the goodness inside. Charley now gets to go travelling all over Holland, when he accompanies his new owner on his business trips. He also loves going out for bike rides in his special bike-cart with his new family. At home he feels safe and loved and has become friends with two fellow cats. A happy ending for a deserving dog. Fovitziari was a fearful, traumatized dog when we first met him. We worried that being separated from his pal Koutcho would be difficult for him. It turns out that there was no need for concern. He made a lot of progress while being fostered with Mariette, and when she saw that he was relaxing into his new life in Holland, she found a permanent home for him not far from where she lives. Now, “Fozzy” is cherished member of a family and best friends with a teenage autistic boy. The boy and the dog, both with their handicaps, have bonded and seem meant for each other. It turns out that Fozzy loves being the center of attention!